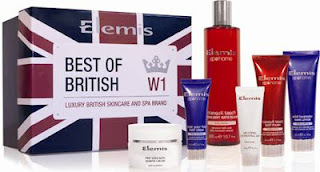 Elemis is one of my favourite beauty brands and for me, the fact that they are British is simply an added bonus. In celebration of the Queen's Diamond Jubilee, Elemis have released a Best of British gift set containing six favourites including the bestselling Pro-Collagen Marine Cream along with Melting Cleansing Gel, Tranquil Touch Indulgent Bath Elixir, Tranquil Touch Body Polish, Wild Lavender Hand Lotion and Treat Your Feet Foot Cream (which was a winner in my 2011 Skin Deep Beauty Awards). It's presented in a keepsake box with striking Union Flag design and a label inspired by the Capital's distinctive street signs. The set, which costs £45, offers the ideal way to indulge in some at home pampering over the long weekend and might be just the pick-me-up that's needed after one too many Pimm's!